Last night I watched a repeat of Taboo: Tattoo on the National Geographic Channel. This program was first aired in February 2003. One segment of the program featured the much tattooed Ernesto Kalum (standing right in picture) of Borneo Headhunter, a tattoo studio based in Kuching, Sarawak. I was rather impressed by this young Iban man. He has, almost single handedly, revived the art of traditional Iban tattooing in Sarawak. According to his resume, he has won numerous awards for his craft at international tattoo conventions. When I saw the program on National Geographic Channel, I felt the same way I did when I saw Sarawak featured in Anthony Bourdain's travel/food show. I was bursting with pride that the Iban people's culture of tattooing was seen in American homes via the television. It is a pity, though, that Iban tattooing is a dying art. That is why people like Ernesto Kalum are important in preserving the Iban traditional art and practice of tattooing. To the Iban, tattooing, among other things, is associated with spiritual beliefs, rites of initiatiation, symbols of social rank and accomplishments in war. 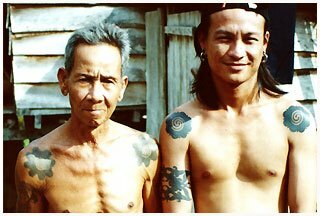 I wish that the young Iban men who want to sport a tattoo or two on their bodies would choose the traditional motifs to the more modern western designs.